ITunes is an essential tool for syncing videos, media, apps etc. for iOS users and if it malfunctions, it creates grave problems for the user. Do not fret! 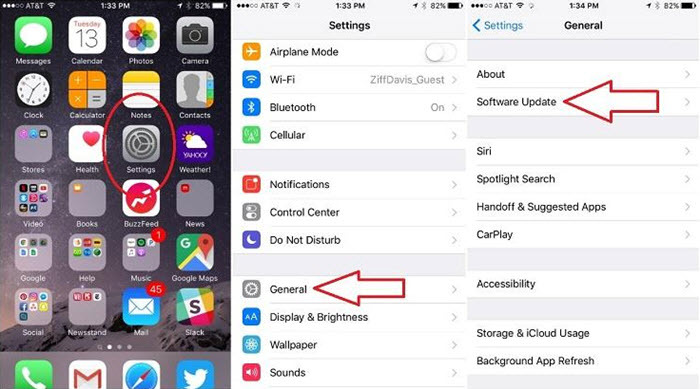 There’s a lot that you can do to fix the iPhone won’t sync with iTunes problem. Sometime, iTunes fails to detect the Apple device connected to your computer due to a faulty port or debris and dirt in the ports. For effective communication to take place between the iPhone and iTunes, up to date drivers must be installed. Obsolete drivers might be the reason behind the sync problem. An Outdated version of iOs may also cause this problem. Faulty synchronization settings can also lead to this error. We will help you fix all these problems related to iPhone won’t sync with tunes in this detailed article. 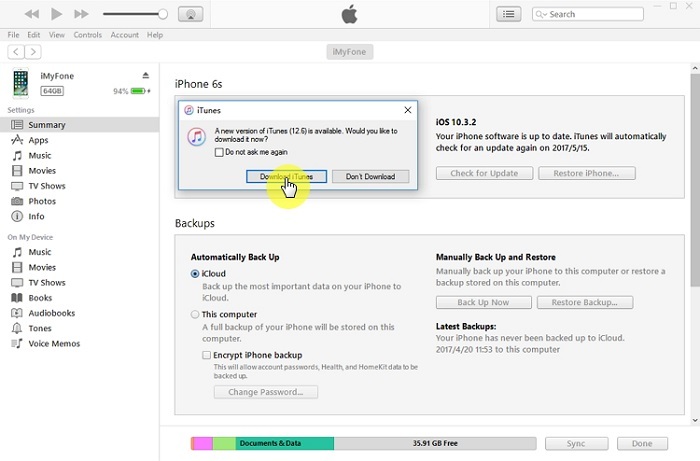 One of the most effective and easiest ways to fix “iPhone won’t sync to iTunes” is to use the effective iTunes sync tool – iMyFone TunesMate iPhone Transfer, to transfer data between your PC and iOS devices. 2-way freely transfer: Transfer files between iPhone and iTunes, or between iPhone and computer. No loss of data: The synchronization won’t erase old data on iPhone and you can preview and selectively sync iTunes data, ensures that there is no loss of data from your apple device during transfer of files. 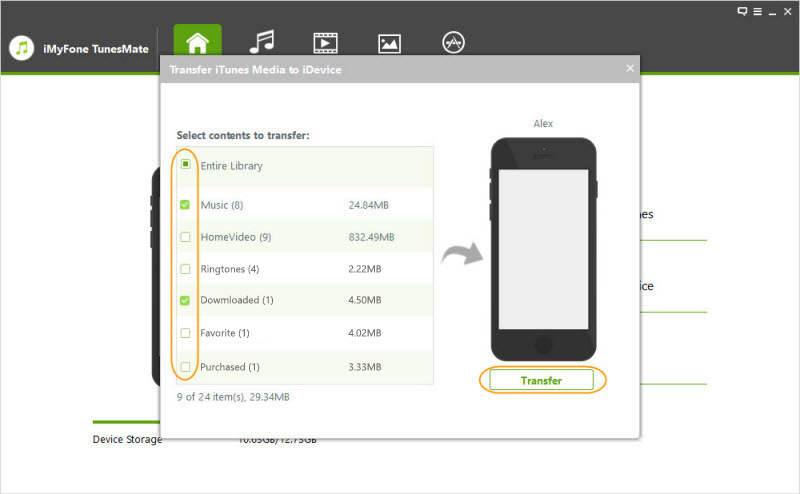 Option 1: even when you iTunes crashed, you can also transfer your iTunes library files to iPhone with TunesMate. Option 2: rebuild iTunes library by transfer files to iTunes from unlimited iOS devices. Moreover, both paid and free files (music or movies) can be selectively previewed and transferred in a matter of seconds. Step 1: Simply launch iMyFone TunesMate and go to the tab of “Transfer iTunes Media to iDevices”. 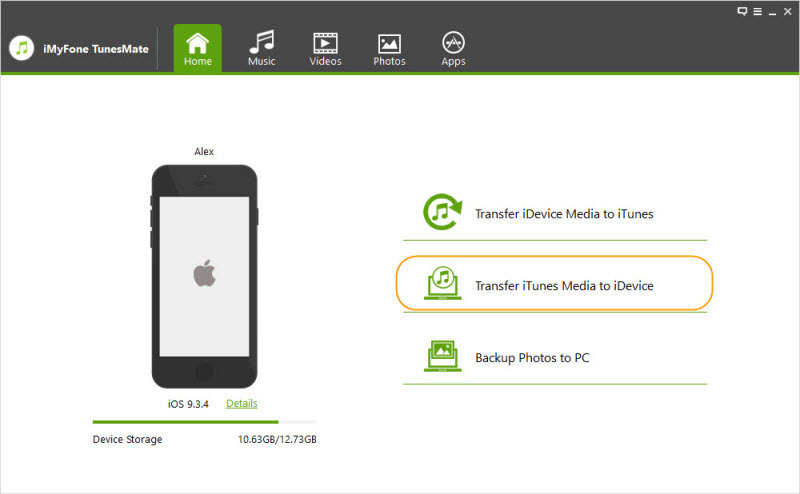 Step 2: Select the type of data and files you want to transfer to your iPhone device. After selectively previewing the files with caution, click transfer and Voila! Synchronization complete! 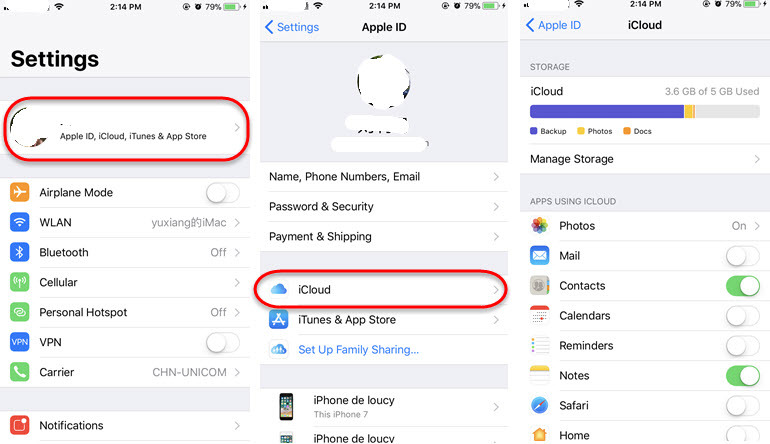 If, unintentionally or accidentally, you’ve changed yout iTunes settings or they’re preset to sync with iCloud, you need to disable that option for iTunes to sync data to your device. In order to deactivate iCloud sync, go to settings > your name > iCloud and turn off the following options: photos, contacts, calendars. After turning them off, see if the syncing problem is resolved. If this doesn’t work, proceed to the next solution. A common problem that arises is that iTunes fails to identify your iPhone. If such a situation occurs, do the following. Clean your USB ports thoroughly and make sure that there isn’t debris or dirt trapped in them. A can of compressed air can be used for this cleaning the ports. Sometimes, it so happens that the USB port doesn’t have enough power to support the USB cable. Charging cables can deteriorate over time. It is advisable to change your USB cable and try again. 3. Restart Your iPhone and Computer and See If It Helps. 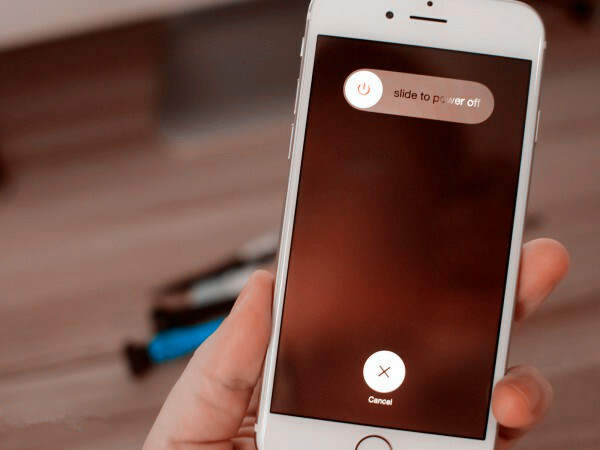 Reboot your iPhone by pressing and holding down the power button for approximately 10 seconds. Restarting your computer might also resolve the problem. Obsolete and outdated drivers might be the reason behind this syncing problem. Follow these steps to update drivers on your Windows computer. Step 1:	Open the Run dialog box by pressing windows and R key simultaneously on your keyboard. Step 2:	Write devmgmt.msc in the dialog box and hit enter. Step 3:	The device manager screen will appear in front of you. Locate the portable devices category and tap the little arrow to open portable devices. Step 4:	Locate your Apple device from the list of choices and right click and select update driver. Step 5:	Next, click browse my computer and go the following drive destination: 'C:\Program Files\Common Files\Apple\Mobile Device Support/drivers and press OK.
Congratulations, you have successfully updated your drivers. Outdated iOS and iTunes software on your computer can also lead to failure in synchronization. Update them by following these easy steps. Step 1:	Locate the menu pane on the top in iTunes. Step 3:	Install available updates. Step 4:	Restart your PC for the changes to take effect. iOS updates are big and require atleast 50 percent battery for completion so, make sure you have atleast that much battery before proceeding. Step 1:	On your Home screen, go to settings. Step 2:	Hit General and select software update. Step 3:	If any updates are available, download and install them. Step 5:	Close your iTunes software and re-initialize the app. See if the synchronization proceeds as usual after doing this. Sometimes this simple solution can resolve the synching problem. Do you occasionally use Wi-fi to sync your files? Try the USB method this time and if you use the USB method, use the Wi-Fi method. See if this interchange solves the problem for you.